Well, the bar was set: winning the Morgan Cup the weekend before. Thursday June 29th Geoff, Peter, Leen, Floris, Boj, Lennard, Harry and Joost H met in Winsome’s Cottage. 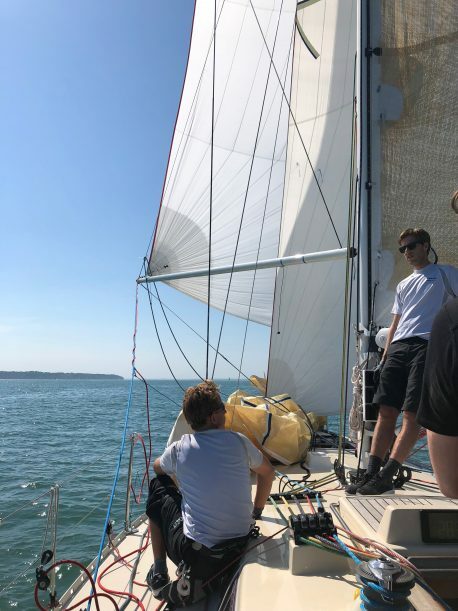 The next day was the start of the RYS regatta: 3 days of sailing around the cans on the Solent. Weather conditions were to be light, lighter than the models initially predicted. The skies were clear blue and temperatures reaching Mediteranean levels. Not really Swanzilla weather, but keeping in mind the results of last weekend we left the dock with mixed feelings on how the day would work out for us. That said, it was great to be back on the water with friends. 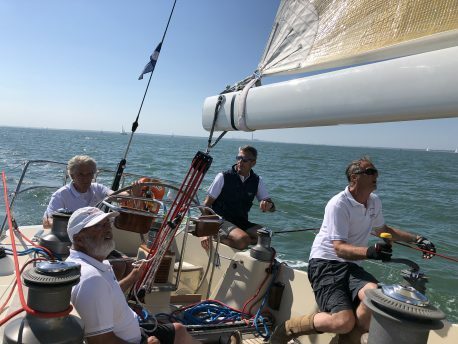 With ten knots of wind and springtide against us Peter, calling tactics, together with Harry manoeuvred us gracefully over the line and the first race was a fact. 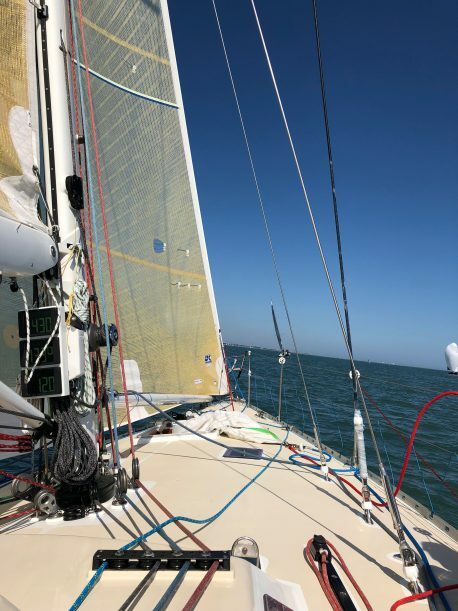 Conditions were light and became even lighter, struggling downwind in these conditions the race slipped out of our hands. In IRC Class 2 we are supposed to be the fastest of the fleet, crossing the line in third place we ended up with a fifth on corrected time. Race 2 was delayed due to lack of wind, yachts couldn’t cross the starting line against the tide. During the posponement we tried cooling down, meeting up with the local ice cream vendor. With all the postponements still to come, this man had a good business this weekend. 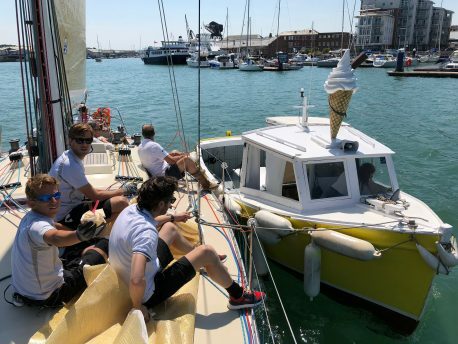 Eventually race 2 was never sailed and we returned to the harbour, enjoying drinks and a BBQ. The next day conditions were basically the same. Harry, dressed to the occasion, drove Winsome in difficult conditions. Races were shortened de to lack of wind, and when we did have wind the shifts were numerous. 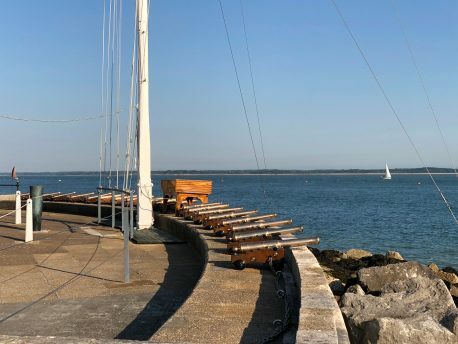 We sailed a second race bringing us back to the RYS at the end of the afternoon. It was another long and hot day on the Solent. Sailing downwind double headed. Norris ahead. Trying hard to catch up, Bullit and Akarana up ahead: the way the field played out this weekend. Both races we finished third on corrected time, behind Bullit and Akarana. Regretfully Harry fell ill that afternoon and could not join us that evening and the next day. Drinks and a wonderful dinner was served at the Squadron Saturday evening. Live music and dancing followed dinner, for some the evening ended drinking whisky and discovering the next day that the whisky was not such a good idea…..
Fortunately for the whiskey drinkers, the last day of racing was spent at a mooring, waiting for the wind to fill, this didn’t happen. Overall we finished third in IRC 2 behind Bullit and Akarana, we won the Corinthian class. 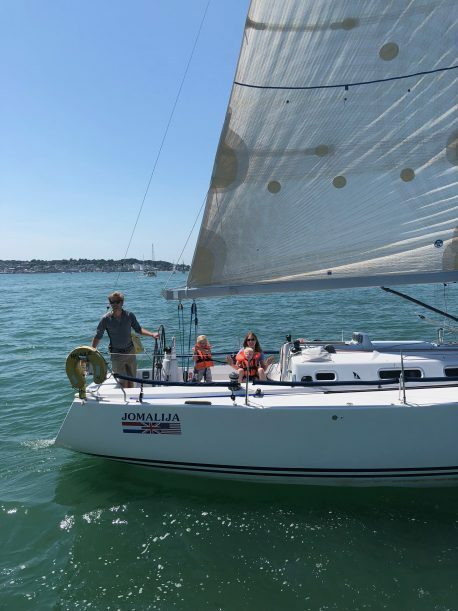 Congratulations to Julian Metherell to sailing a flawless series. Standing on the podium in good company we can look back at three wonderful days of sailing. The race commitee did a wonderful job organising all the races in very difficult conditions. A big thank you to all involved. 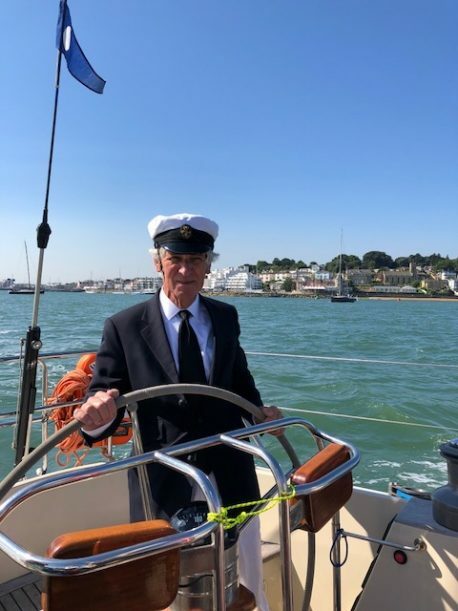 And of course Harry, thank you for having us, again, it is always a pleasure and a privilidge to sail with you. Next week Round the Island Race, watch this space! That was whisky not whiskey. (The e distinguishes Scotch from Irish). Tho’ my Belgian crewman was destroyed by Tequila!